Rollin' down the river with Proud Mary and her krazy krewe! : We Bring Gold! 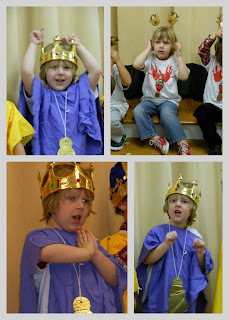 Today was Noah's Christmas party at school. He was a wise man in the nativity scene. His line was "We bring gold" and he practiced and practiced for days to perfect it! The play was so adorable. The kids were all on stage and I swear each kid had both of their parents video taping it and taking pictures on their phone like they were celebrities...and yes, we were right along with them taking a video and snapping away on the camera. You have to capture the memories, right? They sang cute Christmas carols and it was so sweet. I just can't get over how big Noah is, I wish he would stop getting so big! After the play we all had lunch together and I let Noah go wild and have his pick at lunch. He chose cupcakes, chips, cookies and pizza. I put 2 grapes on his plate but he didn't eat that, go figure. His Aunt Mo was even able to come and see his debut as the Wise Man!